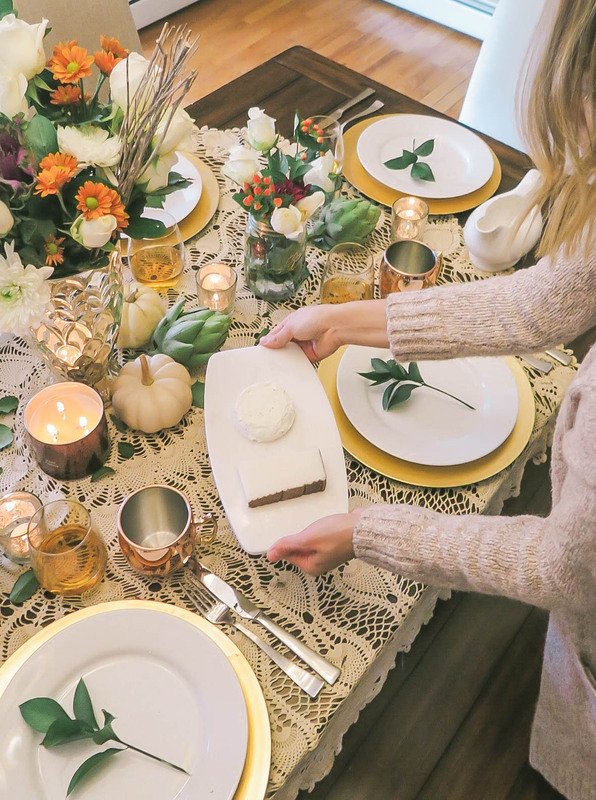 Tonight on the blog I'm sharing a pretty, bohemian and natural inspired thanksgiving table scape. Over flowing with greenery and fresh elements. 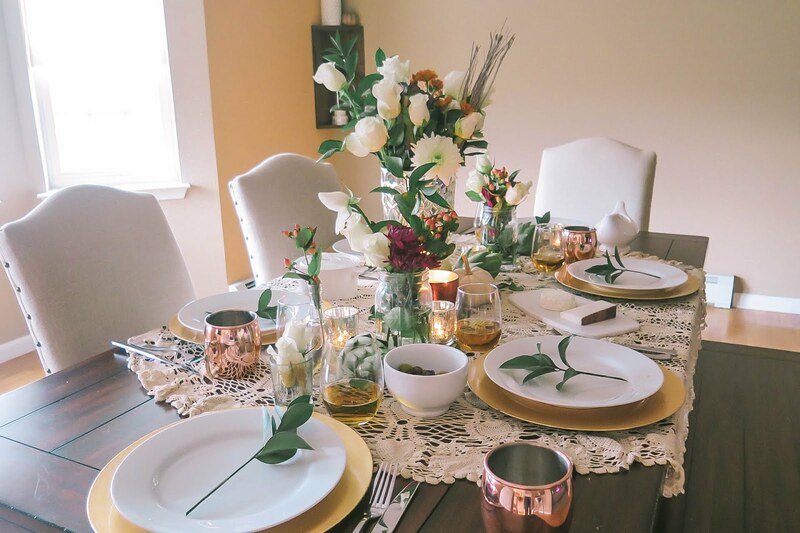 Read more for details on this easy to achieve table decor. Thanksgiving is one of my favorite holiday's!! It's the holiday of bringing family and friends together. My in laws host Thanksgiving every year and our big family gathers together, there's endless amounts of delicious food, I MEAN ENDLESS!! My father in law carves the turkey which is a fun site to see, i'll be sure to share on my insta story this year because it's hilarious. We drink wine, play games and literally "gobble till we wobble" I don't know if there's anything better! Since we celebrate at my in laws, everyone contribute to the day. I love to undertake the role of decorating. It's what I really enjoy doing for every holiday. I love putting together the flower arrangements and making a pretty table scape. I love to set the mood create a feeling for the table. 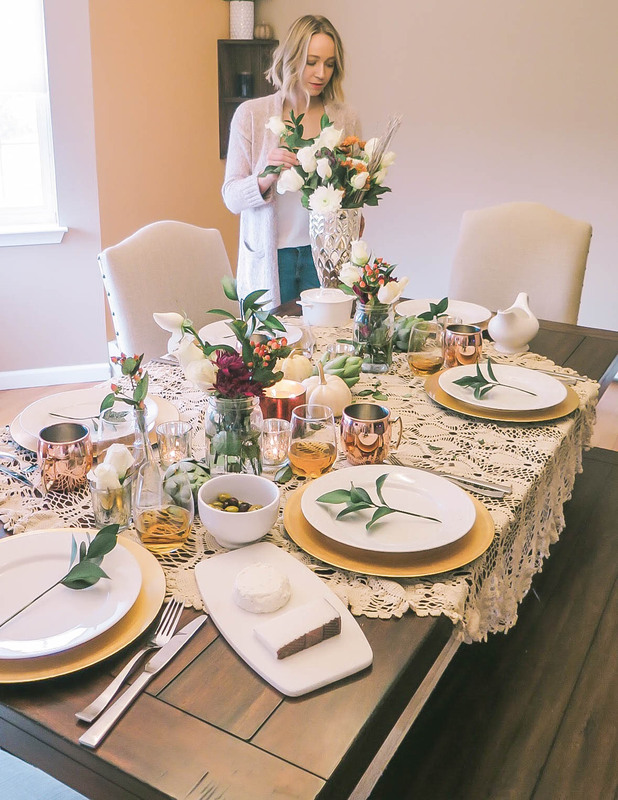 A lot of you may be stressing over food and not really worrying about creating a table scape but I promise that this table scape is very easy to achieve and will be sure to wow your guests. 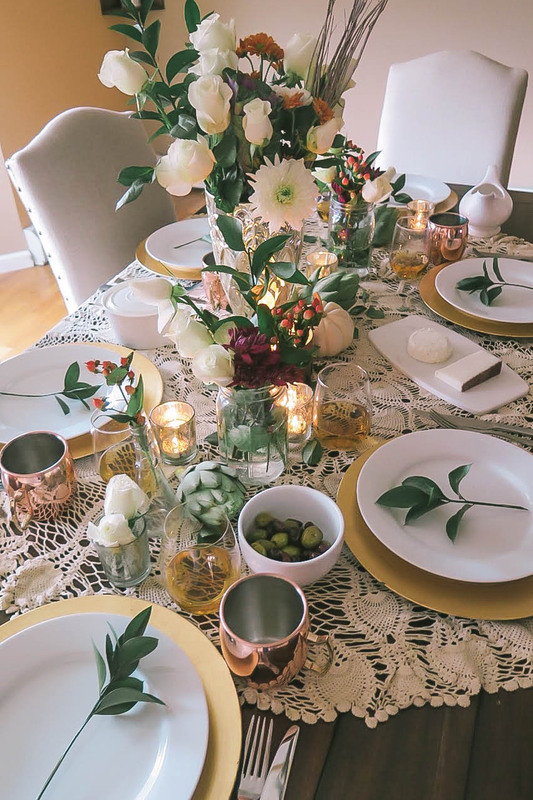 When planning this years table scape, I knew I wanted to keep the color, light and airy. 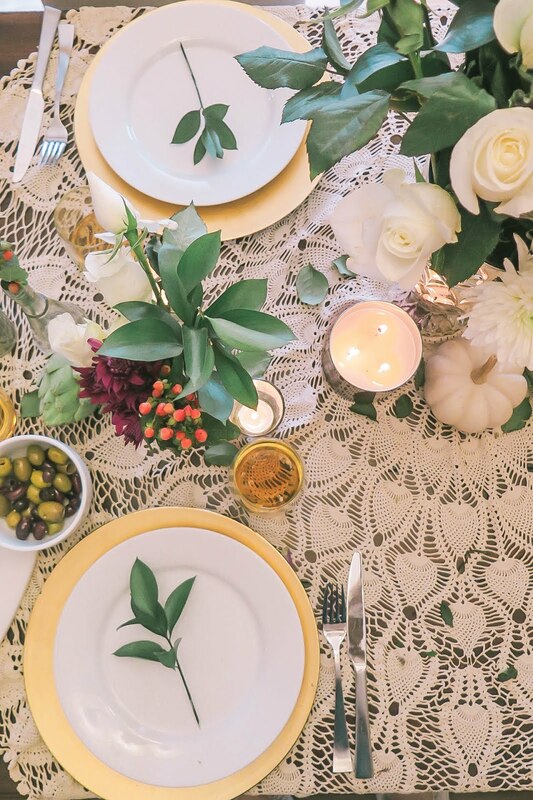 I based my entire vision around this beautiful crochet table cloth which is ivory. I also wanted to keep the colors light and natural. 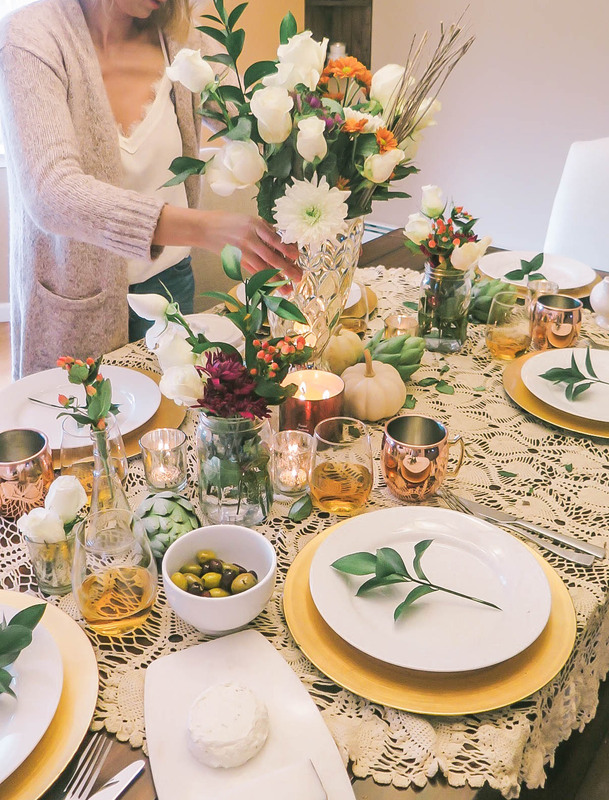 Lots of leafy greens, white roses and pops of autumn colors like purple and orange to tie in thanksgiving. 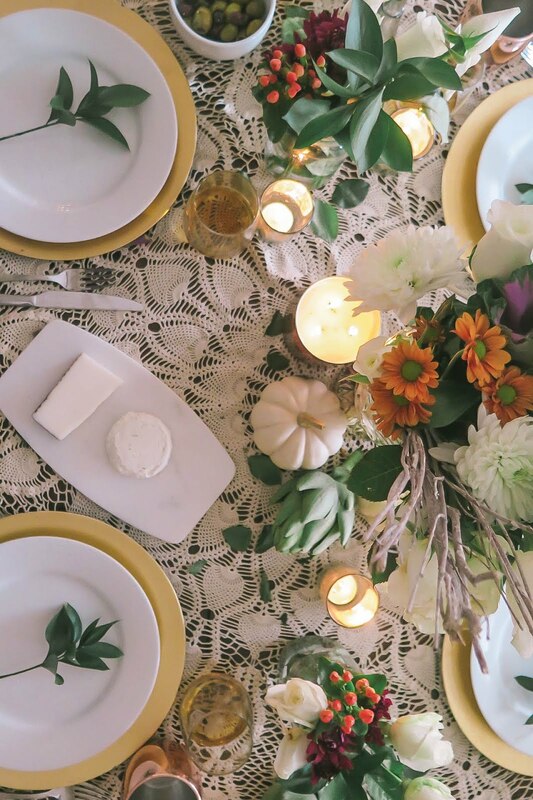 I wanted white and ivory to be the star of the table, not to traditional thanksgiving orange so I added little white pumpkins. 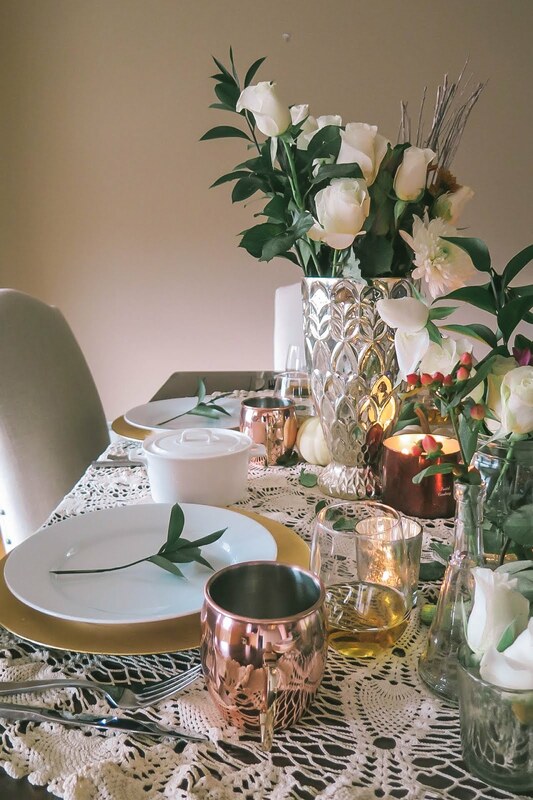 Pops of gold, silver and copper tied everything together nicely and gave it a glamorous touch. 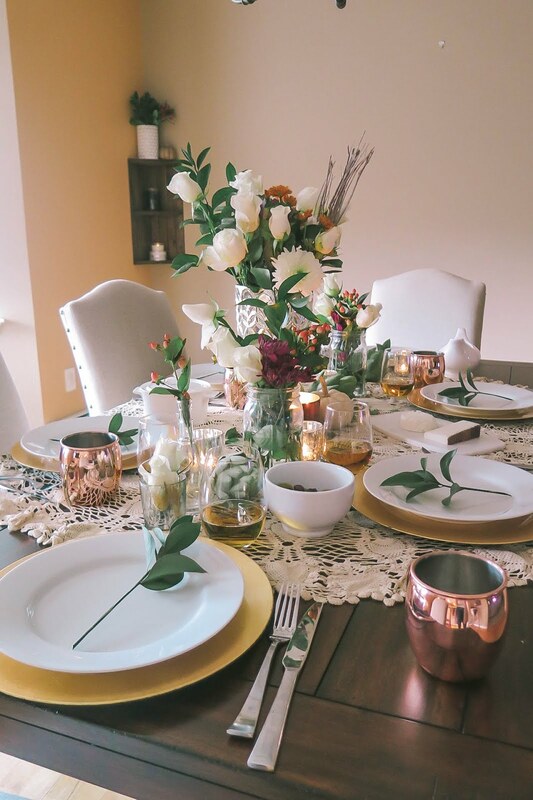 Whenever planning a table scape I love for my floral arrangement to be the focal point. The night before I run to the grocery store and pick up bundles of individual flowers this way I can assemble the arrangements the way I want. I love to have several arrangements running down the table . This table scape has a large center arrangement which is the focal point, I wanted the vase to be a stand out piece. I have two smaller arrangements which accent the center and I just filled mason jars with florals. I also added four mini arrangements on the sides. I picked up lots of leafy greens which make for a pretty filler and with these arrangements I wanted white roses to be the stand out. I filled in the rest of the arrangement with orange and purple colored flowers. Whatever florals you have left over after you make you three larger arrangements, fill in the smaller vases. I used two tea light candle holders for two small white roses And scattered them along the table. 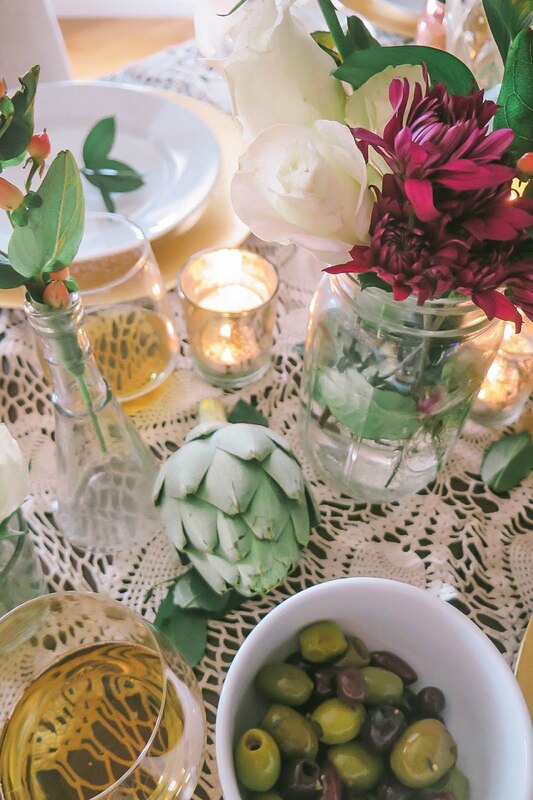 I love to add natural elements to the table. I lined mini white pumpkins and this year I added some fresh artichokes which I felt really went with the decor. But really you can use things you may have laying around. I used apples one year since those are a big hit for thanksgiving. The best thing about adding natural elements is that you can use them after you are done with the decor. Remember to have fun with it and add your special touches! 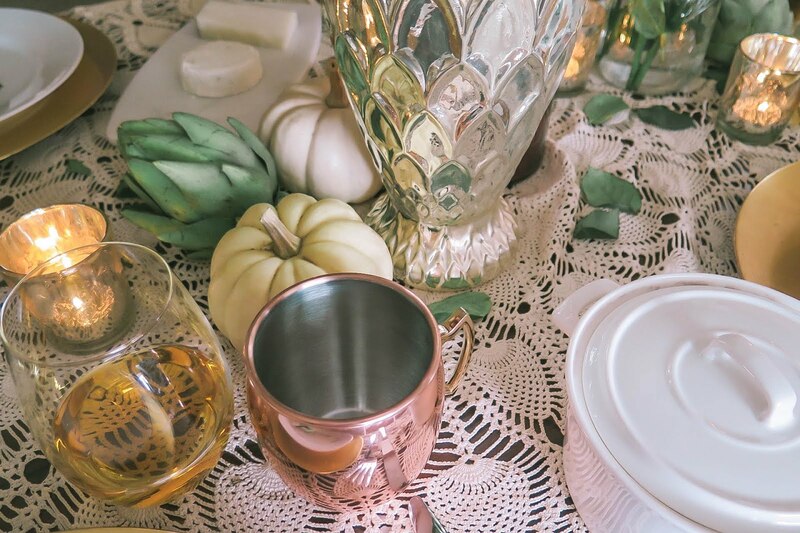 I'd love to see how you decorate this year or what you used for your table scape.